Giada has a new book out and I chose to make a slightly adapted version of her chicken Marsala meatballs to go with a side of deviled white beans with Swiss chard, great on the lighter side of the football food spectrum. The beans can be kept warm in a crock pot/slow-cooker and I have a smaller slow-cooker that the meatballs can be served out of, simply add a nice basket of garlic bread (Jacob’s garlic bread) and a heaping bowl of extra cheese to sprinkle over the meatballs and beans…I also like a sprinkling of red pepper flakes. It took just a few minutes to grind the chicken (in a semi frozen state, cubed) and I tossed in the seasonings and parsley to grind along with the chicken. Unfortunately I realized a little too late that I didn’t have any fresh mushrooms, but I always have a stash of dried mushroom that need just a few minutes to rehydrate and I have a jar of porcini dust that contributes a little more of an earthy mushroom flavor to the meatballs. Once the meatball mixture is ground, add the soaked panko crumbs and the egg, gently mix and shape into meatballs. Another little pantry staple that I have learned to keep on hand is a jar of mushroom base for times just like this, a teaspoon or so gives the broth a little more mushroom flavor as does some of the strained porcini liquid from the soaked mushrooms. 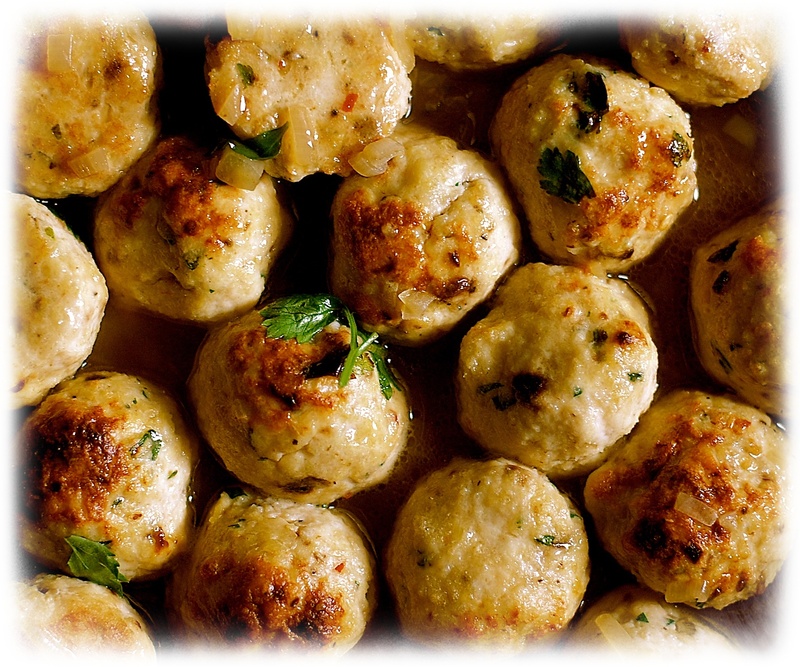 The chicken meatballs won’t get completely browned like other “meatballs” and they finish cooking in the Marsala sauce. Mix together the breadcrumbs, milk and 1 tablespoon Marsala. Leave to soak for 5 minutes. Add the chicken, ( fine chopped porcini if using) pecorino, egg, parsley, 1/2 teaspoon of the salt and the pepper. With your hands, gently mix together the ingredients until just combined. Form the mixture into tablespoon-size balls and place on an oiled baking sheet. Broil for 5 minutes, or until the meatballs are beginning to brown and are just barely cooked through. Remove from the oven and set aside. In a straight-sided skillet, heat 1 tablespoon of the olive oil over medium-high heat. Add the mushrooms and cook, stirring with a wooden spoon, until the mushrooms are brown on all sides, about 5 minutes. Add the shallots and the remaining 1/2 teaspoon salt and cook for another 2 minutes. Lower the heat to medium and stir in the flour and the remaining 1 tablespoon olive oil. Add the 1/3 cup Marsala and stir until the mixture is smooth. Whisk in the chicken broth and simmer for 5 minutes. Add the meatballs to the sauce and simmer for an additional 5 minutes to let the flavors blend. Serve hot, garnished with grated pecorino.